Where does Cape Town get its water supply? Use today’s MapMaker Interactive map to find out. Teachers, scroll down for a quick list of key resources in our Teachers Toolkit, including today’s MapMaker Interactive map. Water, water, everywhere, and not a drop to drink. 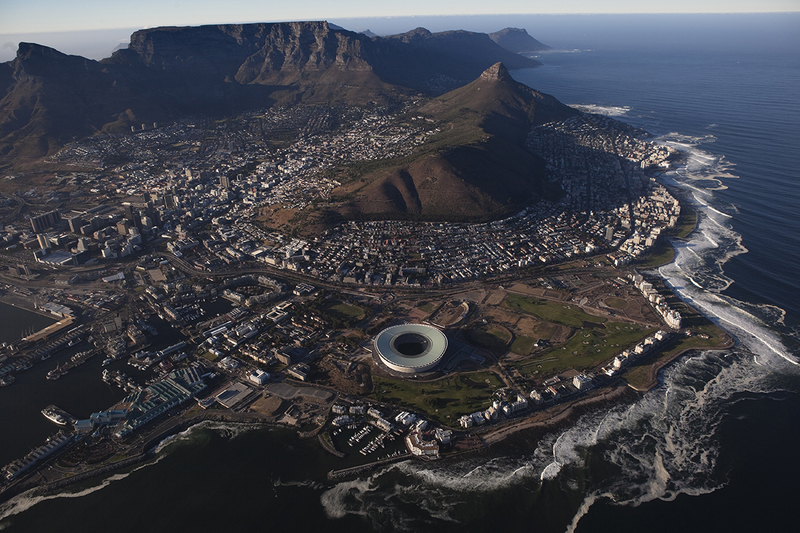 Coastal Cape Town is South Africa’s second-largest city, with a population of nearly 4 million people. Be sure to experiment with layers to better understand Cape Town’s expected precipitation patterns. Where does Cape Town get its freshwater? Take a look at today’s MapMaker Interactive map for some help. The Steenbras dams (upper and lower), collect water from the Hottentots Holland Mountains. The upper Steenbras reservoir is the fullest of Cape Town’s reservoirs, at 90.2% capacity. The lower Steenbras reservoir is at 45.5% capacity. The Berg River dam dams the Berg River to the east of Cape Town. Its reservoir is at 55% capacity. The Wemmershoek dam dams the Wemmershoek River. Its reservoir is at 52.3% capacity. The Voëlvlei dam collects water from the Cape Fold Mountains. Its reservoir is at 18.6% capacity. The Theewaterskloof dam dams the Sonderend River. Its reservoir is at 14.2% capacity. Why are the Western Cape’s dams not at capacity? drought. The Western Cape has experienced three dry winters in a row. What are some other factors are contributing to Cape Town’s water shortage? rapid population growth. The city’s population has doubled since 1999, and is currently approaching 4 million residents. failure to develop alternate water systems. The city is scrambling to develop other water supply systems, including four desalination plants, two groundwater wells, and a facility that would purify reclaimed water. What steps are being taken now to combat the water shortage? Take a look at the handy image above, or download the PDF here to get started. individual or family conservation. Residents are encouraged to take shorter showers, restrict their toilet use, and stop washing vehicles, among other cutbacks listed in the graphic above. community conservation. All community pools, fountains, and showers have been closed. water restrictions. Residents are encouraged to limit their water use to 23 gallons per day, and that number will shrink to 13 gallons in February. This program is voluntary, and only 39% of Capetonians are adhering to the limit. 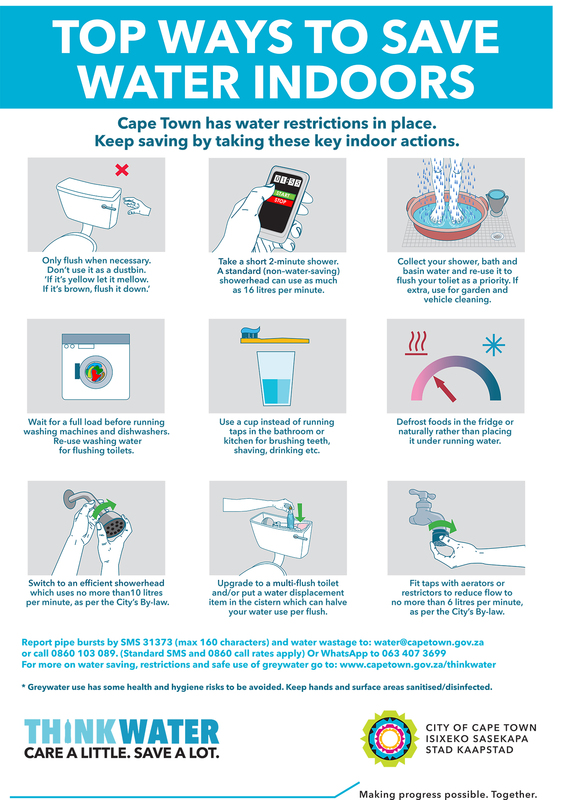 What are some definite or possible water limits once Cape Town reaches “Day Zero”? water rationing. People will line up at one of 200 water stations around the city to collect 6.6 gallons per person, per day. community cutbacks. Municipal water supply may be turned off for all but essential services, such as hospitals. The Los Angeles Times says “a number of details of the crisis plan remain unclear.” What questions remain? How would one person carry 26 gallons of water for a family of four? How would the elderly and disabled cope? What about the fact that officials expect there will be insufficient water to flush the city’s toilets? What impact will this have on Cape Town’s primary industry, tourism? How will cutbacks impact agricultural areas? Where will Capetonians relocate, and are those areas prepared to adapt to an influx of new residents? Is there rain in the long-term forecast for Cape Town? Nat Geo: What is a drought? Previous Previous post: What’s Up with the Shutdown?